In recent literature, there is disagreement over the temporal pattern of vertical governance of firms over the product life-cycle. We use a novel neo-Schumpeterian agent-based simulation model to investigate emerging patterns of vertical governance for different levels of imitability and substitutability of capabilities. We find that, in the mature phase of the product life-cycle, firms generally prefer vertical specialization. However, in the early phase, imitability and substitutability, in interplay, determine the governance form preferred. High imitability frustrates appropriation and thereby discourages integration for synergistic advantages. 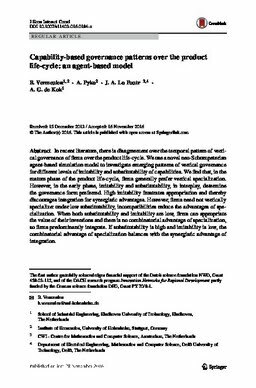 However, firms need not vertically specialize: under low substitutability, incompatibilities reduce the advantages of specialization. When both substitutability and imitability are low, firms can appropriate the value of their inventions and there is no combinatorial advantage of specialization, so firms predominantly integrate. If substitutability is high and imitability is low, the combinatorial advantage of specialization balances with the synergistic advantage of integration.